The Northeast forms a major region of Christian concentration in India today. Of 2.78 crore Christians counted in 2011, 78 lakh are in the Northeast (including Assam). This is among the largest concentration of Christians in India. But unlike other regions of Christian concentration in India, the spread of Christianity in the Northeast is almost entirely a phenomenon of the twentieth century. Much of the Christian expansion in the Northeast occurred on the eve of Independence during 1931-51, perhaps largely during 1941-51. That expansion has continued unabated since 1951. The tribal populations of Mizoram, Manipur and Nagaland have now become almost entirely Christian. In Meghalaya also Christianisation of the tribal people is nearing completion, though some tribes are resisting conversion even now. Arunachal Pradesh escaped Christianisation up to 1971; but Christianity began to obtain a foothold there with the establishment of the civil administration and now more than 30 percent of the population has been Christianised. The share of Christians in the population of several tribes and districts of Arunachal Pradesh is much higher. We have discussed Christian presence in the specific tribes of the State in an earlier note and shall it discuss further for Arunachal Pradesh and other States of the Northeast in a subsequent note. Sikkim in the neighbourhood of the Northeast has also been witnessing rapid expansion of Christianity since 1971; the share of Christians in the population there has reached nearly 10 percent from less than 0.8 percent in 1971. There has been a similarly rapid rise in the share of Christians in the neighbouring Darjiling district of West Bengal. The history and timing of Christianisation of the Northeast indicates that administrative, political and strategic impulses have played a large role in this phenomenon. The early beginning of Christianisation in the hill States of the region was encouraged and facilitated by the British administrators. This facilitation went to the extent of vesting the entire responsibility and budget of school education on the Church in the area that now forms Meghalaya. Christian missionaries obtained similarly close cooperation from the British administration in the Lushai hills, which now form Mizoram. The tentative spread of Christianity through the cooperation of the British administration in the earlier part of the twentieth century was followed by a great spurt at the eve of Independence. The data clearly shows that Christianity got entrenched in the tribal populations mainly during 1931-51. In that period and following Independence, the Church began to inspire and lead the various militant assertions of tribal and regional sub-nationalism in this region. This seems to have helped the continued expansion of Christianity throughout the region after 1951. The expansion has now started encompassing Arunachal Pradesh. Though Christian evangelism is active throughout India, the larger populations of Christians are in a few well-defined pockets. Of 2.78 crore Christians counted in 2011, 1.1 crore are in the two States of Kerala and Tamil Nadu; there are another 26 lakh of them in the western coastal States of Karnataka, Goa and Maharashtra. Thus nearly half of all Christians in India are concentrated mainly on the western coast. After this, their next largest concentration is in the Northeast (including Assam); the seven States of the region accommodate 78 lakh Christians, forming 28 percent of the Indian total. There are also 37 lakh Christians in the central Indian States of Jharkhand, Odisha and Chhattisgarh and in the neighbouring districts of West Bengal. This region has long been a particular target of Christian evangelisation because of its large tribal population. Outside these major regions of Christian concentration, the States that stand out for considerable Christian presence are Punjab, where Christian evangelisation achieved an early success in one particular Scheduled Caste community; and, Andhra Pradesh, where Christians seem to have achieved a foothold among the Scheduled Castes in the recent past. In 2011, 11.3 lakh Christians have been counted in Andhra Pradesh; their actual number there may be much larger. There are 3.5 lakh Christians in the relatively small State of Punjab. The number of Christians elsewhere is small, though they have a considerable share of 21.3 percent in the population of Andaman and Nicobar Islands as a whole and of 70.9 percent in the Nicobar Islands. 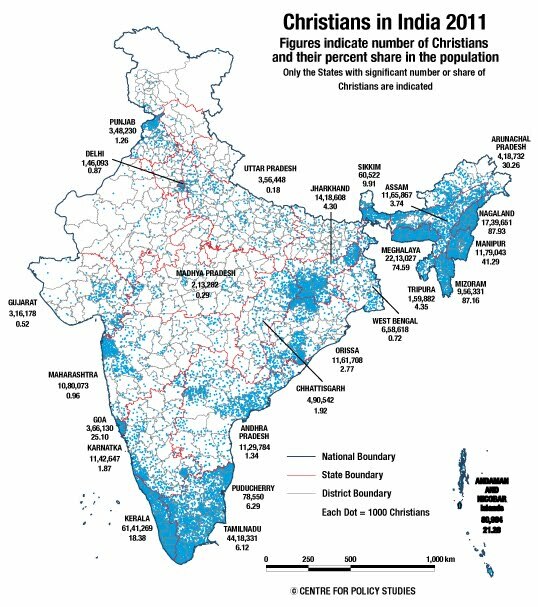 The Map below shows the distribution of Christians in India according to the Census of 2011. In our analysis so far, we have described the major areas of Christian concentration in Tamil Nadu, Kerala, Karnataka, Maharashtra and Goa, in Jharkhand, Odisha and Chhattisgarh and in Punjab and Andhra Pradesh. In this note, we describe the Christian presence in Northeast, which happens to be the most recent region to have acquired a major Christian concentration. There is an important difference between the Northeast and other regions of high Christian presence that we have mentioned above. Christianity had arrived in most of the latter regions before the twentieth century, while Christianisation of the Northeast has taken place entirely in the twentieth century, mostly after Independence. The number and share of Christians did indeed rise considerably in several States of southern and central India during the twentieth century, but there was a significant Christian presence there already at the beginning of the century. In States like Kerala and Goa, the share of Christians has in fact been declining, since the middle of the twentieth century in the former and since the beginning of the century in the latter. In the Northeast, on the other hand, there were almost no Christians at the beginning of the twentieth century; their numbers and share began to rise dramatically in the decades immediately before and following Independence, and there has been no let-up yet in the rapid expansion of Christianity in this region. As seen in the Table here, there were only 35.4 thousand Christians in the Northeast in 1901 when the total population of the region was nearly 43 lakh; they formed less than 1 percent of the population there. After 1901, their numbers began expanding slowly; by 1931, their numbers had multiplied seven times to 2.5 lakh and their share had risen to about 3.5 percent. Compilation of data for the wartime Census of 1941 was somewhat abridged; the drastically reduced number of Christians in that year may not be very reliable. But, in the first Census following Independence, their numbers had reached around 6.6 lakh and they had acquired a significant share of 6.4 percent in the total population. Their growth after Independence has been rapid and continuous. In the six decades since Independence, their numbers have multiplied by 11 times, while the population of the region has increased by 4.3 times. The share of Christians in the population of the Northeast has now reached near 17 percent. In the 11 decades since the beginning of the twentieth century, the number of Christians in the region has multiplied by 209 times, while the total population has risen by only 10 times. The spread of Christianity in the Northeast has been limited largely to the tribal people of the Hill States. If we exclude Assam and Tripura, the two States that are blessed with vast plains and valleys, then the growth of Christianity in the remaining Northeast seems far more dramatic. There were a total of 21.7 thousand Christians in the Hill States of the Northeast in 1901. Of these, nearly 20 thousand were in Meghalaya; there were only about 691 Christians in Nagland, Mizoam and Manipur put together. The region corresponding to Arunachal Pradesh was then sparsely populated and no Census was conducted there until 1971. The number of Christians in the other four Hill States of the Northeast nearly doubled every decade after 1901 and reached 1.68 lakh in 1931. Between 1931 and 1951, their numbers tripled and their shared reached the significantly high level of 31 percent. Since then, Christianity has been continuously growing and spreading to newer areas and tribes in these States. The number of Christians in this region has reached 61 lakh, beginning from less than 0.22 lakh in 1901; they now have a commanding share of 68.4 percent in the population of these States compared to their insignificant presence of 2.7 percent in 1901. The history of Christianisation of each of the seven States of the Northeast has been somewhat different. Below, we look at this process separately for each State. Growth of Christians in Assam has not been as dramatic as in the Hill States of the Northeast. Yet, their number here has increased from just 13.6 thousand in 1901 to 11.7 lakh now. This implies a multiplication of 85 times, while the population of Assam has multiplied by less than 9.5 times in this period. The share of Christians in the population has consequently increased from 0.41 to 3.74 percent. If we ignore the unreliable figures of 1941, the share of Christians in Assam has been rising slowly and steadily throughout the last eleven decades. Only in the last decade of 2001-11, the rise seems to have slowed down. As we have discussed in our detailed note on Assam, extraordinary growth of Muslims there has led to a great decline in the share of Hindus in the population and has also restricted the growth of Christians. In that note, we have also discussed the distribution of Christians in different parts of the State up to the sub-district level and have mentioned their rapid growth in Karbi Anglong and Dima Hsao. Incidentally, most of the Christians in Assam at the beginning of the century were tea plantation labourers from the Chhota Nagpur region. During the twentieth century, especially during the second half, Christianity has spread to other groups also. As in Assam, the growth of Christianity in Tripura has been nowhere as rapid as in the rest of the Northeast. Even so, their numbers in Tripura have increased from just 138 in 1901 to 5,262 in 1951 and to nearly 1.6 lakh in 2011. This implies that the population of Christians in the State multiplied 38 times between 1901 and 1951 and has multiplied 30 times again between 1951 and 2011; and, their share in the population has risen from almost nil to 0.82 percent in 1951 and 4.35 percent now in 2011. As seen in the Table here, rise in the Christian share has become noticeably sharper after 1981. The reach of Christianity among the tribes of Tripura has become much deeper in the last few decades; nearly all of the Christians in the State are from the Scheduled Tribes, as we shall see in a later note. Christian proselytization in the Northeast achieved its first significance success in Meghalaya. At the beginning of the twentieth century in 1901, there were already 21 thousand Christians in Meghalaya; they had a share of 6.2 percent in the population. As we have seen, there were also about 14 thousand Christians in the much larger State of Assam at that time and there were hardly any of them in the other five States. Between 1901 and 1931, the number of Christians in Meghalaya rose to 75.5 thousand and their share in the population jumped to 15.7 percent. Between 1931 and 1951, the process of accretion to their share continued; it reached 24.7 percent in 1951. In the decades following Independence, the share of Christians in the State has risen rapidly from decade to decade, but the extent of growth in different decades has varied widely. In 2011, it has reached 74.6 percent. This is indeed high growth, but notwithstanding the early start Christianity had in Meghalaya its spread in the following decades has not been as dramatic or as complete as in Mizoram and Nagaland, as we see below. It seems that some of the tribes of Meghalaya are continuing to resist Christianisation. We shall discuss the level of Christianisation of different tribes in a subsequent note. There were only 45 Christians counted in Mizoram in 1901 and 2,461 in 1911. Their number suddenly increased to 27.7 thousand in 1921 and further to 59.1 thousand in 1931. The share of Christians in the population by then had reached 47.5 percent. This was the highest Christian presence in any of the States of the Northeast and was the second highest in the country after Goa, where their share in 1931 was 49.0 percent. Christian presence in Goa, as we have seen in an earlier note, has been declining from the beginning of the twentieth century and it soon fell far behind Mizoram. The number of Christians counted in Mizoram was only 47 in 1941. This was probably a reflection of the lack of clarity in the British policy regarding the Christianisation of the Mizos. But whatever ambiguity was there on this issue, it was settled in the decades leading to Independence. In 1951, when the first Census of Independent India was conducted, the share of Christians in the population had reached 90.5 percent. After 1951, their share has been somewhat lower than this peak. This is because of the non-tribal and Buddhist population of the State. The non-Buddhist tribes of Mizoram, as we shall see in a subsequent note, have been entirely converted. In 2011, in the total Schedule Tribe population of 10.36 lakh, 9.33 lakh are Christians; of the rest, 91 thousand are Buddhists, who are concentrated mainly in the southern Lunglei and Lawngtlai districts. “Some of the most spectacular mass movements in India have taken place among the mountain tribes of this little-known province. …In the remote Lushai Hills two Baptist missionaries began work in 1893. Welsh missionaries followed a little later. The Baptist work in South Lushai, the Welsh in North Lushai. “The Superintendent of the Census of Assam (1921) describes the progress made by Christianity as one of most remarkable features of the decade of 1911-21. Manipur is divided into two distinct parts: the Manipur Valley comprising the districts of Bishnupur, Thoubal, Imphal West and Imphal East; and, the Hill District comprising Senapati, Tamenglong, Churachandpur, Ukhrul and Chandel. As seen in the Table below, Christianity in Manipur is confined mostly to the Hill Districts. Of 11.8 lakh Christians counted in Manipur in 2011, 11.2 lakh are in the Hill Districts and only 59 thousand are in the Valley. On the other hand, of the same 11.8 lakh Hindus in Manipur, 11.0 lakh are in the Valley and only around 77 thousand in the Hill Districts. Christians form 91.6 percent of the population of the Hill Districts. Thus, contrary to the impression of limited Christian growth in Manipur created by the aggregate numbers for the State, the Christianisation of the Hill Districts is nearly as complete as in Mizoram and Nagaland, which we discuss below. We shall see in a subsequent note that Christianisation of the Scheduled Tribes in Manipur is so complete that among their total population of 11.7 lakh, only 30 thousand are counted as non-Christian. Another remarkable feature of the religious demography of Manipur compiled in the Table above is the considerable presence of Muslims in the Valley. There are 2.30 lakh Muslims in this part of Manipur, and they form more than 14 percent of the population. On the other hand, there are only a few Muslims in the Hill Districts, where they form 0.76 percent of the population. There are also nearly 2.3 lakh people counted under the category of Other Religions and Persuasions (ORP) in the Valley districts. There are only 5 thousand such persons in the Hill Districts. Nearly all of the ORPs in the Valley record their religion as Sanmahi. In 2001, of 2.35 lakh persons counted as ORPs, 2.22 lakh were Sanmahis. Their number seems to have somewhat declined during the last decade. The breakup of the ORPs among different religions and persuasions in 2011 has not been yet published. As in Mizoram, Manipur and Tripura, there were only a few Christians in Nagaland at the beginning of the twentieth century. Their number in 1901 was just 601 and they formed 0.59 percent of the population. After 1901, their numbers began to slowly expand and reached near 23 thousand in 1931; at that stage they formed 12.8 percent of the population. In the next two decades, during which the process of Independence of India reached its culmination, there was a major spurt in the number and share of Christians in Nagaland. In the first Census of Independent India conducted in 1951, nearly a lakh Christians were counted in Nagaland and they formed nearly half of the then population of 2.13 lakh. Thus, Nagaland was substantially Christianised during 1931-51, but the process was nowhere as complete as in Mizoram. It took another five decades for the share of Christians in the State to reach near 90 percent; a major part of the accretion occurred during 1961-81. Their share reached the peak of 90 percent in 2001. During the last decade, there has been some decline in the number and share of Christians. The Christianisation of the Scheduled Tribes of Nagaland is much more complete than what is indicated by the share of Christians in the total population. Of 17.10 lakh Scheduled Tribe persons counted in Nagaland in 2011, 16.80 lakh are Christians; they thus have a share of 98.2 percent in the Scheduled Tribes. Their share in 2001 was slightly higher at 98.5 percent. We shall discuss the religious profile of the Scheduled Tribes in greater detail in a subsequent note. Another significant aspect of the demography of Nagaland is the slight decline in the total population and also of the Christian and Scheduled Tribes populations during the last decade. The decline needs to be studied, but it should be remembered that this decline of about 0.6 percent has taken place following three consecutive decades of very high growth. The population of the State grew by 33.4 percent during 1971-81, 35.9 percent during 1981-91 and by 39.2 percent during the previous decade of 1991-2001. As we have seen, Christianity began to take root in Nagaland only after 1931, perhaps during 1941-51; a large part of the expansion of Christianity in this State has occurred after Independence. The sudden spread of Christianity in Nagaland on the eve of Independence and in the following decades is generally acknowledged to be related to the assertion of Naga sub-nationality. The Church seems to have encouraged and provided leadership for this assertion. This is true also of Mizoram, but some Christian conversion in that State had occurred even earlier, prior to the various assertions of militant sub-nationalism in the Northeast that began with the dawn of Independence. Christian inspiration and leadership of such movements is acknowledged even by the Church historians. [See, for example, ‘Christian Conversion Movements in the Northeast India’ in Religious Conversion in India: Modes, Motivations and Meanings, ed. Rowna Robinson and Sathianathan Clarke, OUP, New Delhi 2003]. The Union Territory of Arunachal Pradesh was created only in 1972; before that the area constituting Arunachal Pradesh formed the North-East Frontier Agency (NEFA). Arunachal Pradesh was bestowed the status of a fully-fledged State in 1987. Regular census operations in Arunachal Pradesh were conducted for the first time only in 1971. The Census of 1971 counted only 3,684 Christians in a population of 4.68 lakh; Christians then formed just 0.79 percent of the population. But their numbers and share in the population began to rise soon after the establishment of civil administration. Their numbers rose to 27 thousand within the first decade and their share in the population reached 4.3 percent. Since then, the number of Christians has been rising rapidly from decade to decade; and, now in 2011, they have already acquired a significant share of more than 30 percent in the population. In many of the districts, their share is much higher than the average of the State and many of the tribes in the State seem to have been largely converted to Christianity in the course of the four decades since 1971. We have discussed the Christianisation of different districts and tribes of Arunachal Pradesh in an earlier note. This recent spread of Christianity in Arunachal Pradesh also seems strongly inspired and motivated by political and sub-national consideration. We shall discuss the religious profile of the different tribes in further detail in a later note. Sikkim is not generally counted among the States of the Northeast. But geographically, it falls within the same region. Like elsewhere in the region, the number of Christians in Sikkim was negligibly small in 1901. It remained fairly low up to 1971, when there were less than 2 thousand Christians in the State forming barely 0.8 percent of the population. After 1971, however, the number of Christians has started multiplying rapidly. In 2011, more than 60 thousand Christians have been counted in a population of 6.1 lakh; they now have a share of nearly 10 percent in the population of Sikkim. The rise in the Christian share during recent decades has been much larger than Tripura or Assam. The strong growth of Christianity in Sikkim represents another success of the vigorous evangelical activity in the Northeast. In the neighbouring Darjiling district of West Bengal also the share of Christians has risen rapidly from 3.6 percent in 1971 to 7.7 percent in 2011. 1. The northeast forms one of the major regions of Christian concentration in India. Of 2.78 crore Christians counted in 2011, 78 lakh are in the Northeast. This is the largest concentration of Christians in India after the coastal region starting from southern Tamil Nadu and Kerala and stretching through coastal Karnataka, Goa and Maharashtra. 2. Unlike the other major regions of Christian concentration in India, the spread of Christianity in the Northeast is almost entirely a phenomenon of the twentieth century. 3. Much of the Christian expansion in the Northeast occurred on the eve of Independence during 1931-51, perhaps largely during 1941-51. That expansion has continued unabated since 1951. 4. The earliest part of the Northeast to witness expansion of Christianity was Meghalaya. This was largely because the British administrator handed over the responsibility and the budget for school education to the Christian missions. Notwithstanding the early arrival of Christianity in Meghalaya, the spread of Christianity there was relatively slow after Independence. But the share of Christians in the population of Meghalaya has continued to rise robustly from decade to decade and has reached near 75 percent in 2011. It seems some of the tribes in Meghalaya are still resisting conversion. 5. Mizoram was the next State to be Christianised. There was a sudden spurt in the number and share of Christians in the population of this State during 1911-1931. And, in the next two decades of 1931 to 1951, nearly the whole of the tribal population of Mizoram was converted to Christianity. The share of Christians in the population of Mizoram in 1951 was above 90 percent; it was less than 3 percent in 1911. 6. Manipur has been Christianised mainly in the decades following Independence. The share of Christians in Manipur now is 41 percent; it was around 2 percent in 1931 and 12 percent in 1951. The share of Christians in the total population seems less than in the neighbouring States, but this is mainly because of the large non-tribal population of the Manipur Valley. The hill districts of Manipur, which have mainly tribal populations, are almost fully Christian now. 7. Christianisation of Nagaland has happened mostly in the decades leading to and following Independence. The share of Christians in the population of the State was around 2 percent in 1911, 13 percent in1931 and 46 percent in 1951. By 1991, the share of Christians had reached above 87 percent; by that time the tribal population of Nagaland was nearly fully Christianised. Of the Scheduled Tribes population of 10.61 counted in that year, 10.44 lakh were Christians; they formed more than 98 percent of the population of the Scheduled Tribes. 8. Arunachal Pradesh remained beyond the reach of the Church up to 1971, when the area was brought under civil administration. Since then, the share of Christians has been rising rapidly from to decade to decade and has reached above 30 percent now. Many of the tribes of Arunachal Pradesh have now acquired large Christian majorities. We have discussed the Christianisation of Arunachal Pradesh in an earlier note. 9. Assam, like Meghalaya, had acquired a significant Christian presence already in 1901; about 22 thousand Christians were counted in the State then. These early Christians were mostly from the migrant tribes in the tea plantations of Upper Assam. The number of Christians in Assam has since multiplied 85 times and their reach has spread to many of the indigenous tribes. Their share in the population, however, is much less than in the surrounding hill States. Christians had a share of 0.4 percent in 1901; their share in 2011 is 3.75 percent. Their share in the tribal-dominated districts of Karbi Anglong and Dima Hsao, and in some of the Bodo districts, is much higher. 10. There were only about 5 thousand Christians in Tripura in 1951; their number in 2011 is 1.6 lakh. Much of the rise in their numbers and share has taken place after 1981 and particularly during the last two decades. They have a significant share of 4.5 percent in the population now. 11. There has also been rapid expansion of Christianity in Sikkim since 1971. Christians now form nearly 10 percent of the population of the State; their share in 1971 was barely 0.8 percent. Sikkim is not counted among the States of the Northeast, but geographically it falls within the same region. The share of Christians in the neighbouring Darjiling district of West Bengal has also increased from 3.6 percent in 1971 to 7.7 percent now. 12. The Christianisation of the Northeast, especially of the Hill States of the region, during the earlier part of the twentieth century happened largely with the help and encouragement of the British administration. The early spurt in the Christian population of Meghalaya was mainly a result of the handing over of the responsibility of running the government schools there to the Church in the middle of the nineteenth century. 13. The large spread of Christianisation that has occurred in the Northeast in the decades preceding and following Independence was to a large extent a consequence of the Church adopting the role of inspiring and leading the various movements of militant assertion of sub-national identities which began in the region with the advent of Independence. 14. Christianisation of Arunachal Pradesh that has begun over the last two or three decades seems a further expansion of the same phenomenon. 15. Christianisation of the Northeast, thus, seems to be at least partly, if not largely, a result of political and strategic considerations. It certainly is not an entirely religious phenomenon.